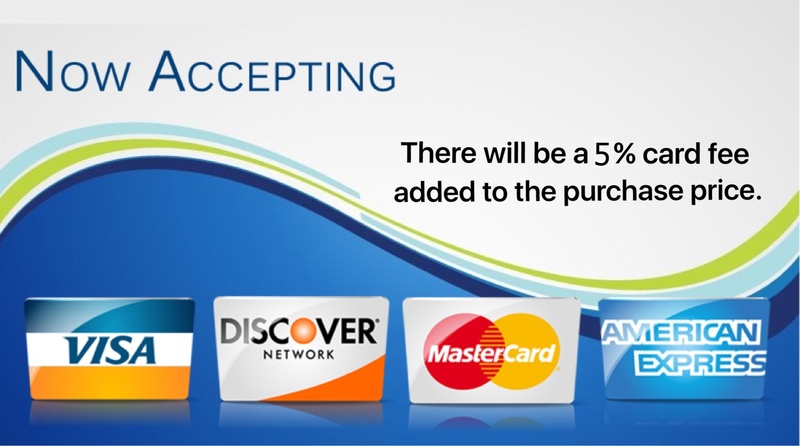 We currently have a number of service dogs available. 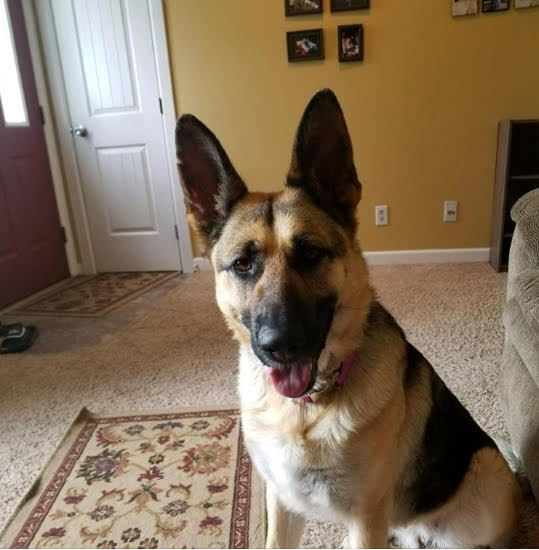 Raven is a 2 yr old shepherd female. She has a ton of drive and is a powerful female. She loves to work and play. 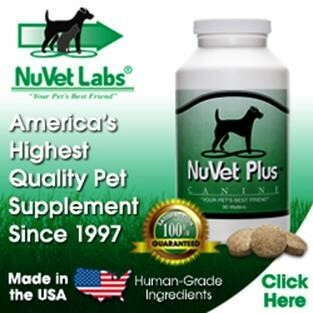 She will make a fantastic service dog or drug dog. She has most obedience and crate training. Rides around in the truck and is an absolute sweet girl. Chris Ferguson served as an infantryman for 10 years in the United States Marine Corps. Chris served three tours in Iraq and one in Afghanistan with two others serving in MEU’s in various places in the south pacific. Chris served with the Second Battalion 4th Marines, 5th Marine regiment, 1st Marine Divisionalso known as “The Magnificent Bastards” during his time of service. He was recognized as one of the longest serving Non-Commissioned Officers to serve 10 years in a single unit at the time. Chris served in Ar Ramadi, Iraq in 2004 also known as the “Battle of Ramadi” where 32 Marines and 1 Navy Corpsman lost their lives and many more wounded by end of the deployment. Chris also continued his service with other deployments to include a second deployment in Iraq in 2006- 2007 during the surge and conducted combat operations in the Haditha triad area doing sweep and clear operations across multiple towns and villages. Chris then deployed to the south pacific on two separate Marine Expeditionary Units to various countries to include Africa, Australia, Japan, Philippines, and other countries like UAE. On one of those MEU’s, Chris was the PSD element’s platoon commander that was responsible for the security of high ranking officials and U.S diplomats abroad. The MEU conducted combat operations in support of Operation Iraqi Freedom. In 2012 Chris deployed to Afghanistan with Second Battalion 4th Marines and was positioned in the northern Helmand region in Musa Qala. 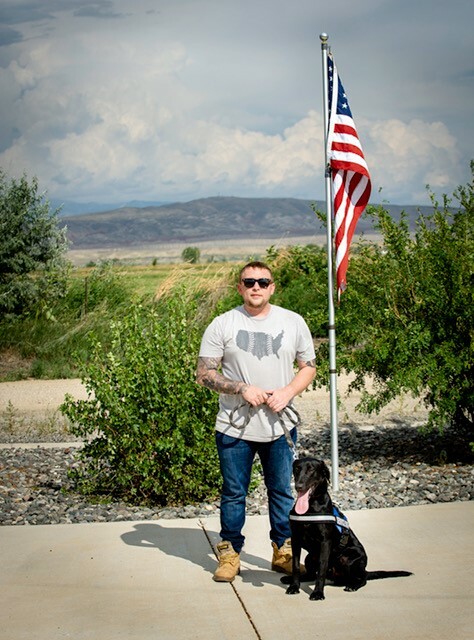 Chris was honorably discharged June of 2013 at the rank of Sergeant and current operating in Sheridan, Wyoming. 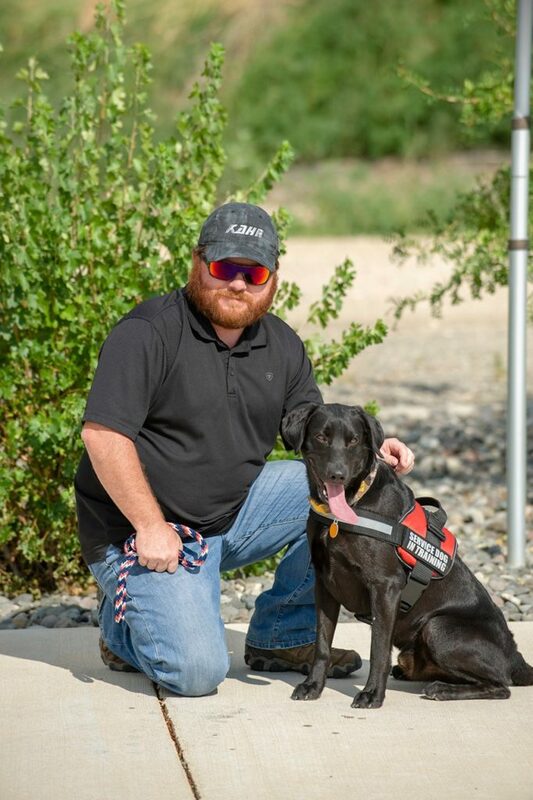 Chris dedicates his time in helping veterans decompress and overcome the struggles they have. Chris enjoys hunting and fishing and living the peaceful life as one can. 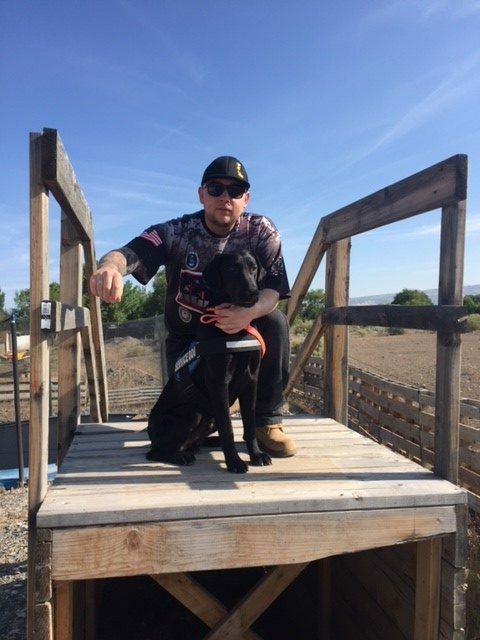 Chris has reached out to Trieven kennels to provide him a service dog to assist him in his hunting and everyday activities. Chris has been paired with Hunter, a 1 year old black lab male. Hunter keeps chris’s mindset right and keeps him calm through his day to day activities. 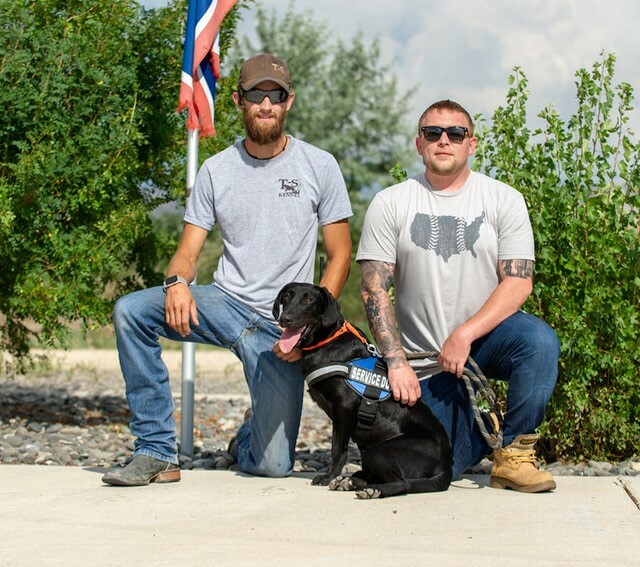 Hunter also aids chris in one of his most favorite activities of hunting which also gives chris a great purpose to keep pushing forward and helping other veterans as best he can. Thank you Chris for your service. BrandoTennery is a 28 year old Army Sergeant, son, and brother. He was born in Tulsa, Oklahoma in December of 1989, then moved to League City, Texas shortly after birth. After graduating from Job Corps in San Marcos Texas when he was 16, he was taken in by his pastor and their family in Dallas, Texas. That’s when he decided he was ready to fulfill his childhood dream and become a soldier in the United States Army. In March of 2008 he went to Basic Training and Advanced Individual Training at Ft. Sill Oklahoma. Upon his Graduation he was assigned to Colorado Springs with the 2/77th Field Artillery Battalion 4th Infantry Division 4th Brigade Combat team. In March 2009, he received orders for his first combat tour to Eastern Afghanistan. 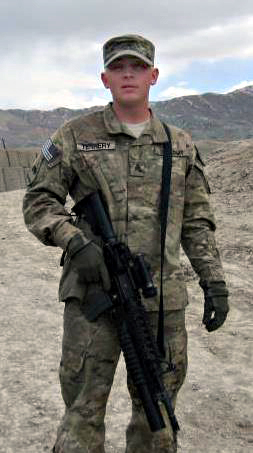 After receiving mild injuries on his first tour his Unit returned to Colorado in June of 2010. After being promoted to Sergeant on his 21st birthday in December of 2010, he came down on Orders to Report to FT. Bliss, Texas in El Paso in May of 2011. After getting to his new Unit 3rd Brigade 1st Armored Division 4th Battalion 1st Field Artillery Regiment, he was told to get ready to deploy. In September of 2011 he received his orders to return for his second Combat tour to Afghanistan, for which he was now in a leadership position and ready to exceed expectations. After several months he deployed to a small Combat Outpost in the mountains getting attacked was almost daily. Then the day of April 11th, 2012 happened. They started taking small arms fire from all directions about 11:00 am. Sgt. Tennery ran to the top of a hill to get the high ground. Following him soon after were his comrades, however they were a little late. When they found him he was unconscious and having multiple seizures. He was thrown and slightly burned from two RPG blasts and a 107 rocket. He also would suffer from a severe Traumatic Brain Injury, slight loss of vision and hearing, balance problems, broken ribs, close to twenty internal injuries and a seizure disorder. His fellow soldiers and the medic did an amazing job getting him strapped to a litter and off the hill while still under fire. He was then Medvaced from the field and first sent to FOB Shank, Afghanistan where his blood pressure rose to 261/158. That’s also where he was intubated and had a sent put in his neck before being sent to Bagram air field, then to Germany for a week before finally reaching his final destination at Brooke Army Medical Center in San Antonio, Texas. There he continued his rehab, got off the cane he was using and was reassigned to The Warrior Transition Battalion at Fort Sam Houston, Texas. He started competing in adaptive sports while in the WTU and won some medals and ribbons. He then started playing baseball again at the beginning of 2013 for the Army Purple Heart Baseball team. They played at Angels Stadium In Anaheim, California facing the Marine PHBB team and beating them 20 to 9. He now lives in San Antonio, Texas and plans to continue school to become a filmmaker and eventually direct his own movies. 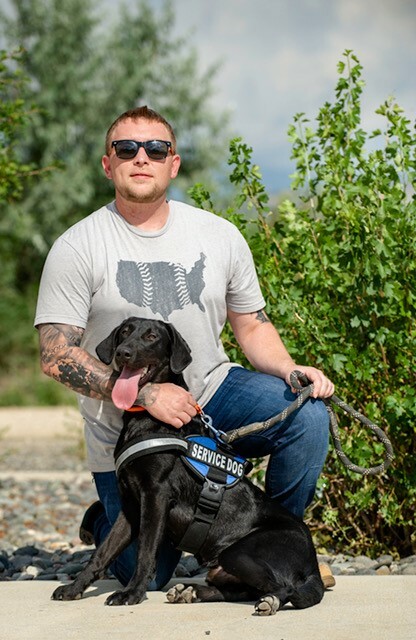 Brandon with his seizure disorder has been a perfect, well deserved candidate for a Service dog. He, with the many help from Beyond The Battlefield has came to Trieven Kennels to be paired with Jack. 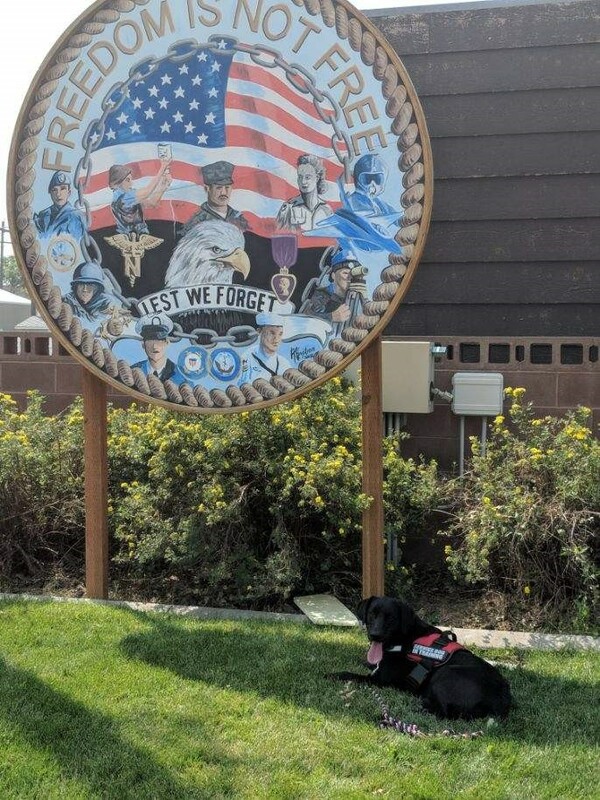 Jack is a 9 month old black lab male that will help Brandon be able to do his normal day to day activities again and protect him when a seizure happens. Thank you for your service Brandon, and best of luck.